A pregnancy pillow is a form of support you require for if you’re pregnant or suffer from pain while you’re trying to sleep. There are many sizes, styles, and options available – and that’s not even including the cover materials and filling substance. As a result, you can’t choose the first pillow you see and expect it to work for you. You have to weigh up your needs against the products available and see which one meets the mark. Here are ten pillowsthat might. If you’re heavily pregnant and are now beginning to struggle to get a decent night’s sleep, then this pregnancy pillow from Queen Rose could be worth trying. While it’s no miracle cure, it uses its 55 or 61-inch length to provide ample support and comfort for your entire body. When you lay down with it, you can experience relief from back pain, sciatica, and all manner of discomfort-related symptoms. The soft, velvet cover will also prove to be gentle and supple against your skin. When the time comes to wash the pillow, you won’t have any problems here either. You can unzip the cover, soak it in your machine, then put it back on. Reinserting the pillow into the case is quite the challenge, but you will get quicker over time. This pillow is going to work wonders for many people, but it’s also not without its flaws. The filling loses shape, flattens in high-pressure areas such as between the knees, and the cover retains heat. If you are sweltering hot at night, you need something that will regulate your temperature and keep you fresh, not make you even more uncomfortable. However, given its quality, durability, and comfortable U shape, this pregnancy pillow is still worth looking into. Some production issues stop this pregnancy pillow from being the best on the market, but that doesn’t mean it’s not going to impress a whole lot of pregnant women and people in pain. It’s packed full of many wonderful features that may be all you need to add it to your shopping cart. Firstly, you can choose a color to suit your needs. There are six to choose, and all of them will suit your home décor well. What’s more, the pillow is in the shape of a C, meaning you can snuggle into it on your bed, couch, or even your floor. No matter where you put it, it hugs your body and provides that much-needed support. While you’re hugging it, the softness of the jersey knit cotton cover will impress. Even after several washes, it remains soft and comfortable. However, it can be hard to take it off and put it on after washing it, and the stitching and zips are not as high-quality as they need to be. Fortunately, this pregnancy pillow comes with a lifetime warranty to give you peace of mind that they can resolve any issues. If you buy this pillow, you may find it’s one of the best pregnancy purchases you’ve made. Pregnancy aches and pains can make sleeping a nightmare, so it might be time to act sooner rather than later and buy a pregnancy pillow from PharMeDoc. Aim for a better, more comfortable night’s sleep with this U-shaped pillow. At 53 inches long, it’s one that wraps around your body, and it features soft and cloud-like filling that sees you well-supported and drifting off to sleep in no time. If you’re worried about the functionality of it once you need to clean it, then don’t be. Even though it’s a large pillow, the cleaning process is straightforward. Remove the zippered cover then put it in the washing machine; it’s that easy! You can then put it back on as good as new. 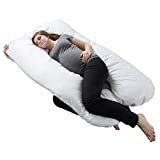 Each part of this pregnancy pillow features separate cotton pillows, which means you can make the cushion shorter or longer, depending on your needs. It also has plenty of filling to ensure you’re as comfortable for as long as you need to be. However, over time, the filling flattens out, and the pillow loses a lot of its comfort. 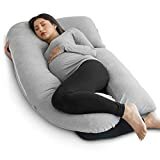 There is much to think about before you buy this pregnancy pillow, so weigh up the pros and cons of each feature before adding it to your shopping cart. When you find yourself uncomfortable and unable to sleep, you might find this pregnancy pillow from Ang Qi can solve the problem. You don’t even have to be pregnant to reap the rewards. As a supportive full body pillow, it contours to your body to provide back pain relief while encouraging a peaceful night’s slumber. There is plenty of polyester fiber filling to see you sleeping well, but it’s important to know that this can flatten over time. However, you can move the stuffing around, adjust the pillow’s position, and place it however you need it to be for your comfort. The jersey cover, which you can buy in several colors, is removable and washable. There is also a double zip to make this process easier. However, many people find the jersey fabric to be scratchy – even after multiple washes to soften it. Such irritation can be a deal breaker. The top of the pillow is also too bulky for some people’s heads which can have them trying to squish the filling around. This pregnancy pillow has a few flaws, but it’s more than suitable for many people’s needs too. 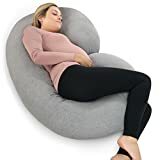 Even though you are going to need to spend a lot of time trying to put the cover on this pregnancy pillow after washing it, it’s still a lovely option for any pregnant woman looking to experience pain relief. If you can get past that minor point, and some filling flattening over time, you’ll see it’s an excellent option. When the time comes to buy this pregnancy pillow, you can choose from two sizes – 55 and 65 inches, and one of four colors. You then get to enjoy 7D polyester filling which is plump and comfortable and a cotton cover which is hypoallergenic and straightforward to remove. Meiz has even put effort into the inner liner which features microfiber fabric with a brushed flower effect. Sealing the deal is knowing this pregnancy pillow will provide 360-degree support. You can lie in the center of it, cuddle it around you, or move it in any direction. No matter where you need support, this pregnancy pillow can supply it. 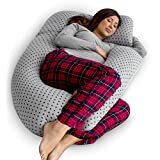 If you don’t want a traditional pregnancy pillow taking over your entire bed – leaving no room for you or your significant other, then downsize to this option from Boppy. Even though it doesn’t provide full body support, it offers it where you need it the most – and sometimes that’s all you require. There are many things to love about this pregnancy pillow from Boppy. Firstly, it’s stylish while being functional. The cover is a grey jersey slipcover with a delicate trellis pattern. As a result, it blends in well with most sofa cushions and bedspread sets too. Then, it’s small and compact. Not every pregnant woman needs a large pregnancy pillow taking over their bed. This contours to your body, targeting the areas that need support the most. Even when it comes time to wash it, this pillow delivers on convenience. You can remove the cover then clean it, before putting it back on and zipping it up with no problems at all. If there’s anything to complain about, it would be the durability. There’s no denying the polyester within is comfortable and plump, but it doesn’t stay that way. Over time, it gets lumpy and loses its shape. Hopefully by then, however, you’ll be holding your bundle of joy in your arms! 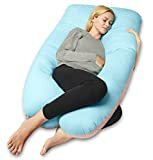 For anyone who struggles to sleep on their side, wants to learn how, or wants support while they do, then this pregnancy pillow is for you. Boppy now offer a side sleeper pregnancy pillow that retrains you to sleep in a more beneficial position – but one that’s comfortable too. This pregnancy pillow consists of two connected pads with virgin fiber filling and a stretch panel. The panel sits there to nestle the two pillows into your body to provide an ultimate level of support. You can also use it to lie on your back, or while you’re lounging on the sofa trying to get into a comfortable position. The ease of care will impress you as much as the support. You can wash not only the removable slipcovers but the pillows too. Every component is washable and straightforward, leaving you with just the task of trying to get comfortable. This pregnancy pillow is all about providing ample support – but not breaking the bank in the process. Enjoy everything it has to offer. For side sleepers, pregnant women, and people in pain, this pregnancy pillow from Marine Moon could tick all the boxes for your needs. Its U shaping means you can snuggle into it, while the jersey cover – while thin – is soft and comfortable against your skin. It’s also generously sized at 69 x 31 inches which tends to be larger than other pregnancy pillows on the market. The internal components may have you adding this pillow to your shopping cart too. It features 7D polyester fiber, with over one pound of additional stuffing to ensure it’s plump and supportive. However, the extra filling can’t change the fact that this pregnancy pillow is lumpy. It’s convenient for moving stuffing around, but not so much if you need to get comfortable in a hurry. The lining also doesn’t tend to instill a lot of confidence when you consider the price tag. It’s thin and snags, while the white color is not practical for keeping clean. There’s no denying this pillow is good value, but it has a long way to go until it’s at the top of the food chain. Whether you’re pregnant or uncomfortable in your bed, you may find that this pregnancy pillow more than helps your situation. It’s not the best quality option on the market, but it’s also not the worst. One of the most standout features of this pregnancy pillow is its versatility. It’s in a U shape but also comes with a removable piece you can add to one end, the other, or in the middle for better support. It’s also 60 inches long which is plenty – or even too much for on your bed. When it comes to cleaning, this pregnancy pillow is effortless to maintain. You can remove the soft velvet cover and take care of it with ease. However, be careful of the stitching. Quality control is an issue, and some of it may come undone. If you are handy with a thread and needle, you may like to strengthen the stitching in place. All in all, this mid-range pregnancy pillow has some issues but will provide ample support all the same. If a traditional pregnancy pillow hasn’t seemed to work for you so far, then why not try something different? This side sleeping double wedge pillow could be the ticket. It includes two firm and stuffed wedges to support either side of your belly and a velcro-adjustable center panel that allows plenty of room for your stomach. It also offers a polyester cover and filling to be soft and supportive. Even care of this pregnancy pillow will impress. You can remove and wash the cover with no problems at all. Enjoy the support, style, and unique blue and pink color scheme of this pregnancy pillow from Poraty. Finding out you’re pregnant is a joyous occasion, but then nine months of uncomfortable sleep follows. If you’re struggling to get more than a few hours every night, then consider how a pregnancy pillow could help. Factor in these points below then begin the shopping process! The definition of a pregnancy pillow can differ significantly, which means the size can too. Pay attention to the dimensions. Do you want support for your stomach, or a full body pillow to lie with you in bed? Some pillows are as tall as you are, while others act as support around your belly so you can sleep on your side. Think about the reasons for getting a pillow. Do you want to sleep on your side but need something to train you? Or, do you want something that will contour to your body to support your back and bump? Every pregnancy pillow caters to different needs, so read supplier instructions for use properly. The filling for each pregnancy pillow can differ and can end up being disappointing if you don’t pay attention. The most common filling type is polyester, but you need to read the reviews to get a gauge on the firmness. If there is too much stuffing, the pillow is hard. If there is not enough, it can go lumpy and flat. Washing a pillow is never easy, so find out what the supplier recommends. You will be pleased to know that most pregnancy pillows have covers you can unzip, wash, then put back on. Some even let you wash the entire pillow.